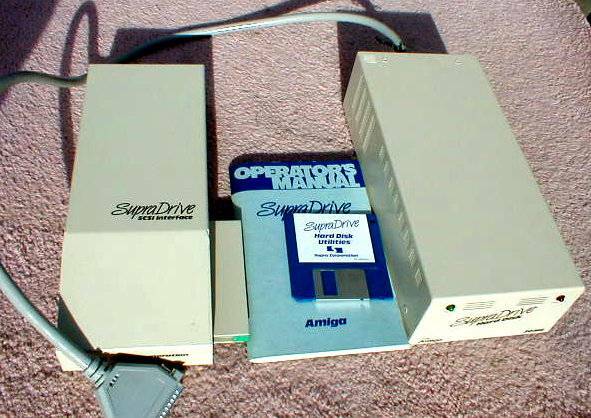 The SupraDrive SCSI is very similar to the SupraDrive 4x4 but is intended for use with the A500/+. The system comes in two units, the first unit contains the SCSI controller and attaches to the side expansion slot. The second unit contains the hard disk and is attached to the first by a 37pin cable. The main unit has a pass through for other expansion cards and an expansion connector for an additional 2MB of RAM. The hard disk unit also has an external 25pin SCSI connector and was supplied with a 20MB hard drive. Page contributors: Iggy Drougge, Paul Gable.